Sarah Seabrook has received three national scholarships. TAMPA, Fla. -- A University of South Florida College of Arts and Sciences student is one of 50 students to receive a Udall Foundation Scholarship, a $5,000 scholarship to support research related to the environment. Sarah Seabrook also becomes a member of a national, professional network of scientists, activists, educators, lawyers and others working on environmental issues in addition to receiving the scholarship money. The award is given for a commitment to the environment. Seabrook is an Honors College junior double majoring in marine biology and environmental science and policy. She now has won three national scholarships, including the Gilman Scholarship for summer 2012 where she traveled to Indonesia for a research internship at Operation Wallacea, an environmental research and expeditions organization. 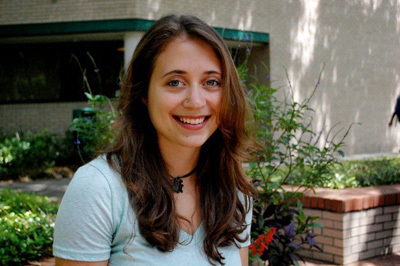 She is also a 2012 recipient of the Hollings Scholarship for oceanic and atmospheric sciences sponsored by the National Oceanic and Atmospheric Administration (NOAA). As part of the Hollings Scholarship, Seabrook spent the summer conducting a research project at the National Marine Sanctuary of American Samoa assessing the impacts of climate change on the coral reef community within the sanctuary. During her time at NMSAS, she assisted with the Ocean Star program, a summer education program targeted at educating late elementary school children on ocean science and conservation. She interned in Hillsborough County Commissioner Kevin Beckner’s office under the School of Public Affairs Legislative intern program (LIP). Currently, Seabrook is the Vice President of the Food Activists Revolutionizing Meals (FARM) Club, as well as a member of the Student Environmental Association and the Biology Club. She is conducting a research project in the marine ecology lab of Department of Integrative Biology professor Susan Bell, to evaluate the food web dynamics between natural and restored oyster reef systems through stable isotope analysis. Seabrook also works part-time at the Bearss Groves Farmer’s Market. Seabrook hopes to acquire a doctoral degree in biology with a concentration in ecology, evolution and population biology. She hopes to then work as a researcher and professor and collaborate with scientific and environmental organizations across the globe to produce the knowledge needed to further the conservation and management of marine life. Established by Congress in 1992 to honor Morris K. Udall’s 30 years of service in the House of Representatives and enhanced by Congressional action in 2009 to honor Stewart L. Udall’s vast public service, the Morris K. Udall and Stewart L. Udall Foundation is dedication to educating a new generation of Americans to preserve and protect their national heritage through scholarship, fellowship and internship programs focused on environmental and Native American issues. The Udall Foundation also is committed to promoting the principles and practices of environmental conflict resolution.